The first humans were very bored but one briliant mind thought of something quite entertaining. Whilst sitting on the toilet he figured they could make a launcher for it so they will have something to do in their spare time. Set the aim and launch the toilet and yourself as fast as you can. 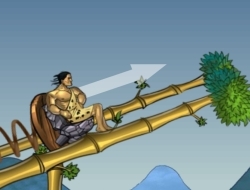 With each jump you will earn some money with which you can make your contraption better. This is the best invetion since the wheel so make sure you will make it perfect. You should visit the shop after you have a bit of money to get more distance on your jumps. Upgrade it to the max and in the air use click on yourself to flush and go even further and faster. Use the mouse to aim and fire, then to flush the toilet. Rocket Toilet 2 0.00 between 0 and 10 based on 0 votes.